Lucifer: Season 3 brings the DC’s Vertigo imprint comic book character back for another adventure into the seedy side of L.A. and this time the series production actually moves to L.A. rather than shooting in a wintry Vancouver substituting for L.A. Tom Ellis is back in his role as the Devil, Lucifer Morningstar, who continues to question himself and his relationship with the woman he has feeling for, Detective Chloe Decker (Lauren German) while his brother, the angel Amenadiel (D.B. Woodside), is also going through a period of self-reflection as he tries to regain his wings and his angelic powers. The main conflict in this third season comes in the form of enigmatic Lieutenant Marcus Pierce (Tom Welling, Smallville), who catches the eye of Chloe, and raises the jealousy of Lucifer. But Pierce is hiding a dark secret – an a dangerous one that could be harmful to Chloe. Lucifer seemed to be hitting its stride in season 3, which is why it was surprising that Fox announced it wouldn’t be bringing the series back for another season. It caused an uproar amongst fans who launched a campaign to save the show. Fortunately for fans, Netflix stepped up and announced they would be picking up Lucifer for the fourth season. So there will be one more season at least of this witty fantasy detective series. Lucifer: Season 3 was shot in HD on the Arri Alexa and arrives on Blu-ray in an AVC 1080p encodement framed at 1.78:1. The picture is excellent with fine detail and natural flesh tones. 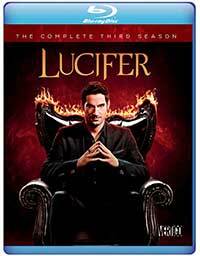 Lucifer: Season 3 comes to Blu-ray with an English DTS-HD Master Audio 5.1 soundtrack. It has clear dialogue and good dynamic range, but doesn’t offer much beyond that other than some ambience. Both bonus episodes are included plus several deleted scenes. The three-part Off Script with Tom & Tom featuring a friendly interview with Tom Ellis and Tom Welling asking each other and answering fans’ questions are the best special features included on the discs. Lucifer: Season 3 finds the series really coming into its own and ending with a stunning surprise ending. Where will the series go from there? Thanks to Netflix, fans can find out in season four. Meanwhile, this Blu-ray collection comes with a fine set of features and excellent picture quality.